“Eat an onion from each new place you visit to adjust your body to the local cuisine.” — Words of wisdom from one of our guides on the subtle appreciation of eating one’s way through Iran. 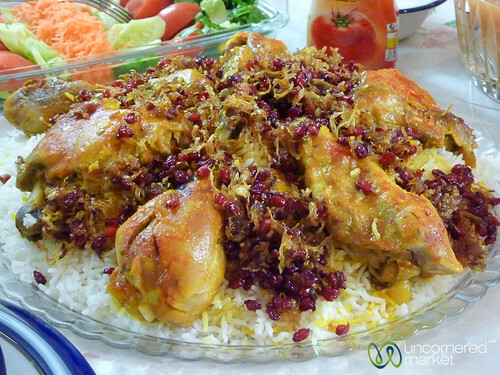 Traditional Iranian cuisine combines the savory of fresh herbs and spices like saffron, merges it with the sweet of pomegranate, barberry and cinnamon and tops it all off with a flourish of nuts, dried fruits and beans. The result: not to present one distinct flavor, but to serve up layers that keep the taste buds guessing as to what is and what’s coming next. 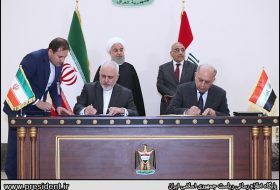 Although this article could be entitled Persian Food, today’s greater Iran is ethnically broader than its Persian roots. So too its cuisine. 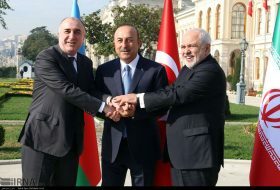 Influences on the Iranian table draw from across Central Asia, Turkey, throughout Mesopotamia, and most notably from its own Azerbaijani Turkish population — to yield a cuisine that is influenced by it all, yet somehow distinctly different. Here are a few favorite, notable and common Iranian dishes that we found in the weeks we traveled across Iran. 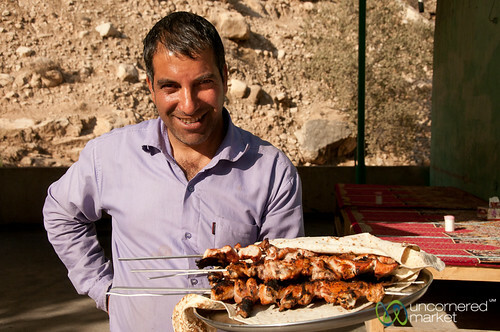 Kebabs are taken very seriously in Iran – so seriously that the kebab menu alone may run a few pages and feature every style and cut of skewerable grill-worthy meat imaginable. 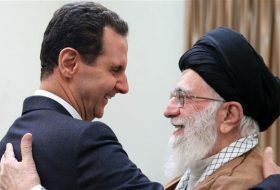 The first few times someone invites you to dine with them in Iran, you’ll be tempted to think the entire country kebab-powered. 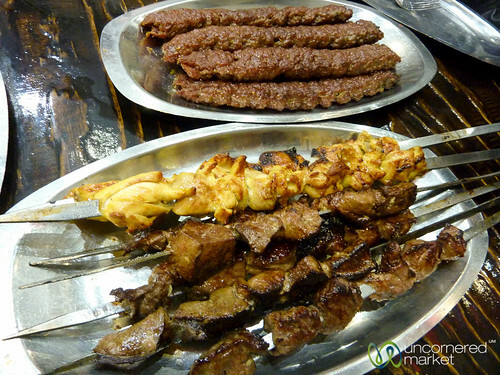 An assortment of kebabs for dinner in Iran. Lamb, minced or in chunks, is most popular. And kebabs are often served with grilled tomatoes, a healthy plate of rice and flat bread, and raw onions. (One roadside kebab stand thought we were crazy for suggesting the onions be grilled.) Our favorite: kebab koobideh, minced lamb mixed with herbs. You’ll find that one kebab order is often more than enough for two people to share. To say that rice, a 4,000 year old staple of Iranian eating, is hugely important to the Iranian food landscape: culinary understatement. In our cursory look, taste and research of the subject of Iranian rice, it’s clear that a full-length dissertation could be written about the subject, after which arguments of clarification of terms and names of dishes will ensue. Trademark fluffy white Iranian rice served with kebabs, stews and other mains. Bottom of the pot rice crust served by itself or merged with slices of potato, flats of bread, meat, vegetable, fruit and nuts like pistachio. Shirazi baqala polo (rice with dill and beans). 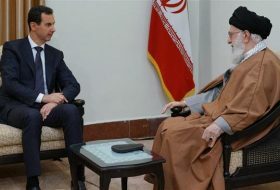 Drained, sieved rice cooked until its moist, then layered with bread or potato and blend them with oil in bottom of pot. It’s topped with a bit of saffron and small minced pistachios. Soft, clumped rice with a slight crust served in Northern Iran. 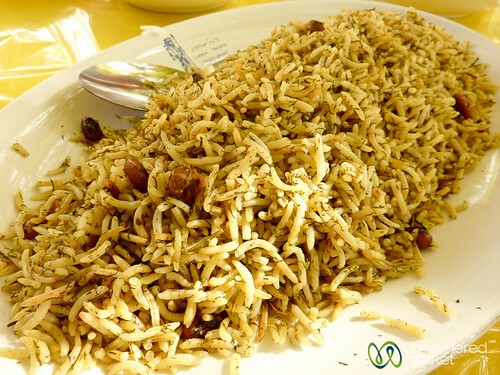 Kateh polo is softer than Abkesh and is usually served in traditional restaurants in villages and rural areas. For a delightful and detailed layman’s guide to making Iranian/Persian rice the right way, check out this post. Tehrani buffet: several types of khoresht with a chunk of tal deeg rice crust. Some khoresht favorites include: Khoresht-e-Ghorme-sabzi, a stew of meat, vegetables and beans that features a bit of a greenish appearance; andKhoresht-e-Ghymeh, a stew of meat, potato, tomato and split peas. 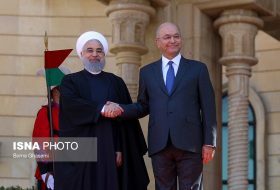 Though technically a khoresht, fesenjen (Khoresht-e-Fesnjan) stands alone. At turns tart, sweet and savory, fesenjan is a stew of ground walnut, pomegranate juice mixed with your meat of choice (chicken is most common). Regional variation will yield, sour and savory fesenjan in Northern Iran while you’re apt to get something a little bit sweeter elsewhere. Fesenjan is typically a special occasion dish, so you won’t find this on the daily menu in most restaurants. You may have to make arrangements to have it prepared especially. Ask around. It’s most certainly worth the effort. Dizi and abgoosht are competing names for stone pot Persian stew that’s consumed following an almost ritualized eating procedure. Dizi is a hearty, heavy dish fit for the mountains, featuring mutton soup broth thickened with chickpeas, onion, potato, tomatoes, turmeric and various other white beans, all cooked in ceramic pot. The liquid is then strained away and served in a bowl on the side. As an interactive bonus, you’re given a pestle-type instrument to crush and mash to a pulp the solid bits (gusht-e kubideh) left in your stone pot. Served with flat bread (piti) and the occasional side of pickled vegetables. Straining the liquid from dizi in the mountains outside of Hamadan. We were fortunate to try it twice, once in a restaurant and once homemade as part of a picnic at St. Stephanos church. The latter was the clear winner for freshness and taste. 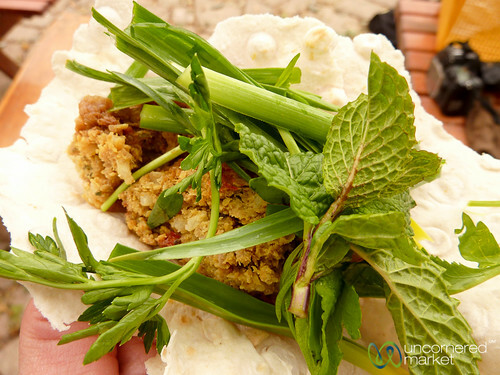 Tabriz Köfte can be found in the northwestern part of Iran, the provincial capital of which is the city of Tabriz. It’s a variation of the traditional Turkish köfte(minced meatball). The Tabriz köfte is essentially an oversized meatball made from either minced meat and spices (or for vegetarians, barley and spices), served with piles of fresh greens and herbs. After all those kebabs, Tabriz köftestrikes the body as refreshing, particularly when it’s served on flatbread with all those greens. Homemade Tabriz köfte piled high with fresh herbs and green onions. Iranian green been stew. We list this dish not because we had the good fortune to eat it, but because in retrospect we should have sought it out, particularly because we’d traveled with a vegetarian during one segment of our trip and she had a notably difficult time finding vegetables untainted by meat. If you are vegetarian and traveling in Iran, ask for lubia (beans) and in particular, lubia sabz. A tasty vegetarian dish that hails from the Northern Iranian Caspian region. It’s based on roasted skewered eggplant seasoned with garlic, tomato, turmeric, oil or butter, and salt. The seasoned eggplant is then turned with eggs. The whole thing is then served with bread or rice. A thick, almost stew-like soup. However, you’ll find ash in all varieties of thin and thick depending on where you are in the country and who happens to be stirring the pot. We enjoyed one of our favorite bowls of ash with a bunch of guys crammed into a soup cafeteria on their lunch break in Tabriz. Another tasty variety is Ash-Reshteh (nooodles, vegetables and herbs) that we had the good fortune to enjoy in the mountains village of Masuleh. 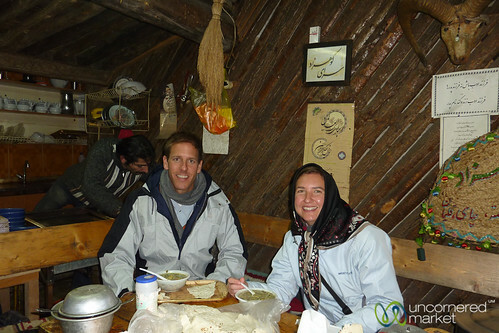 Enjoying a bowl of ash-reshteh in a mountain hut, Masuleh. Steamed & spiced fava beans are a popular street snack, especially in the mountains. Delicious with some vinegar, red pepper and marjoram. After all the meat we’d eaten in Iran, our group was thrilled to inject some legumes into the diet. We ate almost the entire stash below. Joking (kind of). Spiced fava bean mountains, in the Hamadan hills. I don’t know if roasted red beets are typical to the Iranian street food scene, but this display of roasted beets on a stick in the Northern Iranian town of Ardabil was one of the more beautiful and unique street food presentations we’d seen in a while. 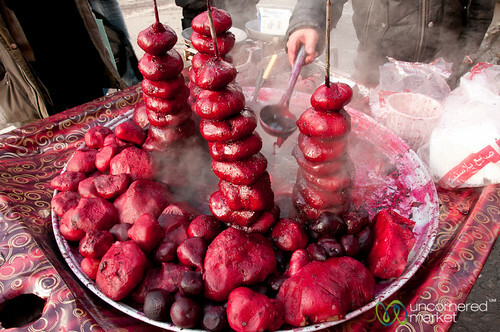 Roasted red beets on the streets of Ardabil. Interesting how the Farsi word for bread (nan) is similar to the Indian term. Linguistic history often gives a sense of how much we all have in common and how far back that shared history really goes. A stretchy elliptical bread usually baked on a bed of small stones or pebbles. Perhaps the most common bread you’ll find across Iran. Comes plain or in varieties topped with sesame or other seeds. If you’ve done everything right, you should have secured a few slabs of sangyeh as gifts (that is, for free) along your travels across Iran. Mmmm. 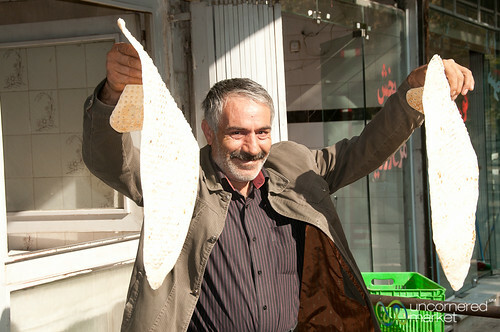 Sangyeh, Iranian flat bread fresh from the bakery. 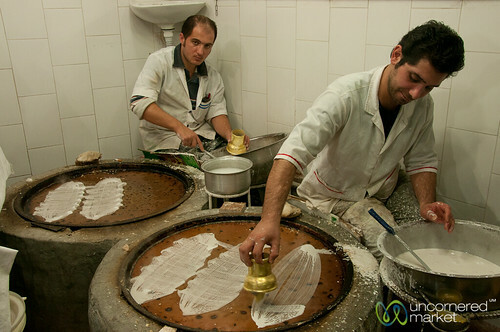 A thick bread, oval-shaped and the famous bread staple of the northwestern Iranian town of Tabriz. Perfect to bring along and share on train ride from Tabriz to Istanbul. Our guide, Ali, knew this and bought us a bagful to help us survive our 60-hour journey. Vermicelli noodles sloshed in a cold syrup of sugar and rose water. You can also ask for a sweet lemon juice variety. A specialty of the town of Shiraz. In the short time that we hung out in the old Shiraz bazaar we were offered so many bowls of falooda that we had to start turning them away. Locals are proud to share this with visitors. 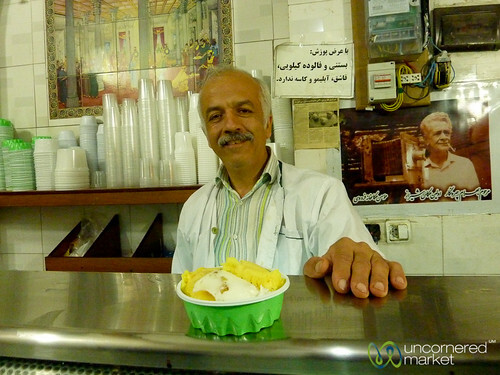 Bowl of faloodah, old school Iranian ice cream in Shiraz. 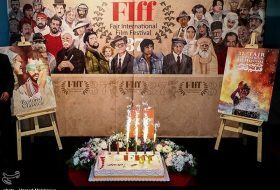 Iranian ice cream gets its own entry because it has been said that Iran is the birthplace of the miracle we’ve come to know as ice cream. We’re not here to dispute or affirm that, however. The local varieties we’d tasted were sweet, often fruity, not especially creamy, and somewhat strappy compared to the ice creams and gelatos we’ve come to love. In any event, do as the locals do and take a dip of flavors, especially saffron and pistachio. 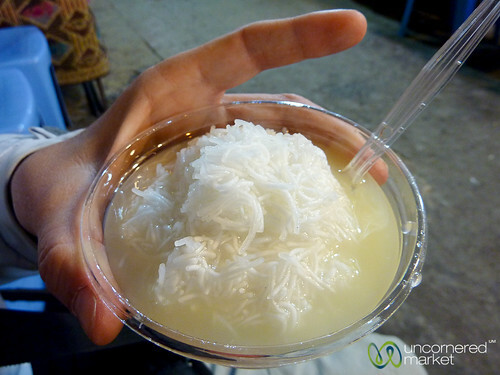 This is a popular dessert across this part of the world, especially in neighboring Turkey. A sweet made from ground sesame paste (tahini), halva not only satisfies the sweet tooth but it’s also packed with protein. One could call it the original power bar. 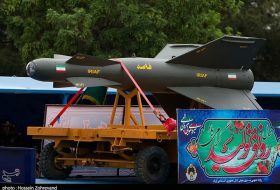 OK, these things are amazing and fabulously unique to Iran. Four leaf clover-shaped cookies made from finely sifted chickpea flour, rose water, powdered sugar and sweet spices like cardamom — topped off with finely chopped pistachios. The result: melt in your mouth magic. 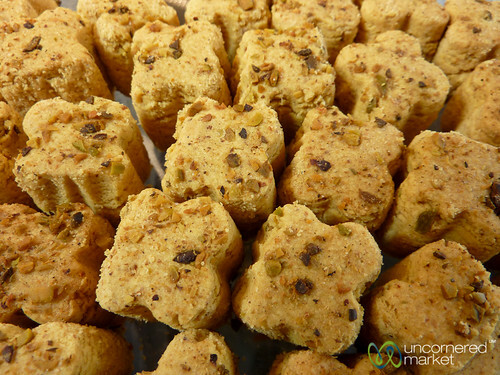 Melt-in-your-mouth nokhodchi (Chickpea Cookies) in Esfahan. Buy kilos of them, for as easy as they are to make at home, to make them well is an art exquisitely executed by only the finest bakeries in Iran. 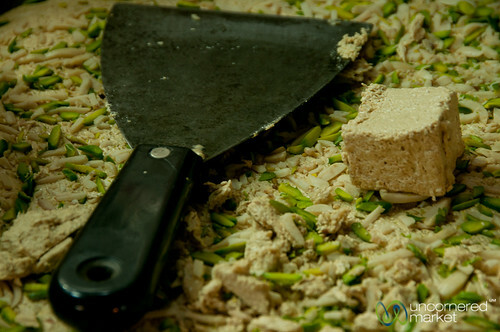 Traditional Persian nougat based on the milky sap collected from angebin, a plant from the Tamarisk family found only in the dry outskirts of the Iranian city of Esfahan. Gaz is spun with various ingredients including rose water, pistachio, almond kernels and saffron. Gaz is a specialty in the tourist center of Esfahan where you’ll find shops selling all variations and qualities. Stock up if you are looking for gifts for the sweet-toothed. Hint: Look for and purchase the gazvarieties with the highest pistachio count. 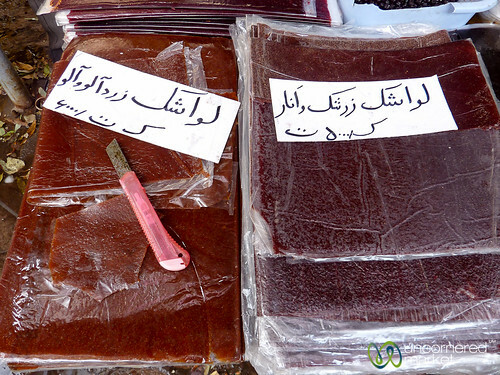 Persian-style fruit leather. Iran is a dried fruit mecca, so fruit leather fits. The taste, consistency and value is absolutely nothing like you’ll get from packaged fruit roll-ups in your local grocery store. The sweet-tart fruit flavor will make your mouth pucker like never before, after which you won’t be able to stop tearing off strips and eating large chunks like an animal. Some of our favorite lavashakflavors include pomegranate, apricot and sour plum. Beware of lavashak vendors, however. You may think you’re buying only a small piece, but you’ll end up with enough fruit leather to make an outfit. 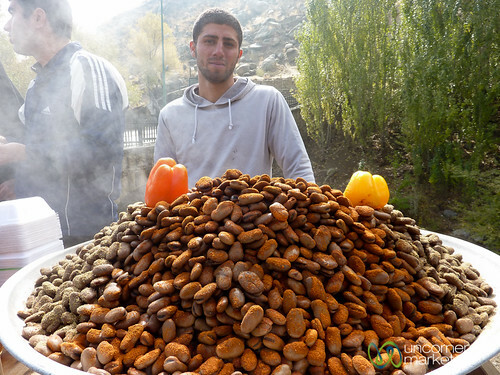 Apricot and pomegranate lavashak (fruit leather) in Kandovan province. Decorative yet tasty cookies that are special to the town of Fuman (northwestern Iran). The town is flush with bakeries selling only these cookies.Koloocheh are stuffed with a cinnamon, walnut and sugar filling. When they are fresh and warm just out of the oven, they are special packages of melt-in-your-mouth goodness. Koloocheh from the town Fuman, northwest Iran. 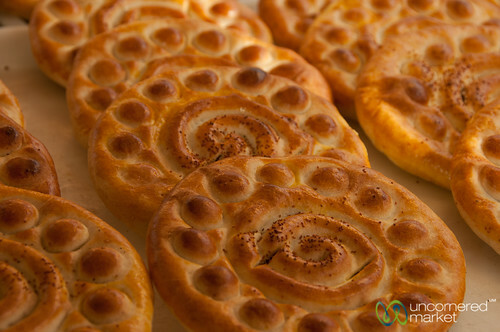 If you come across a pastry-ish cookie-like confection that looks like a gauze bandage, you’ve found reshte and khoshkar, specialties of the Caspian area (and specifically the town of Rasht). The khoshkar bandages or leaves are stuffed with walnut, sugar and cinnamon, are typically fried and soaked in a sweet liquid.Reshte are similar to Khoshkar, but come without walnuts or sugar. Khoshkar bakers at the Rasht central market. 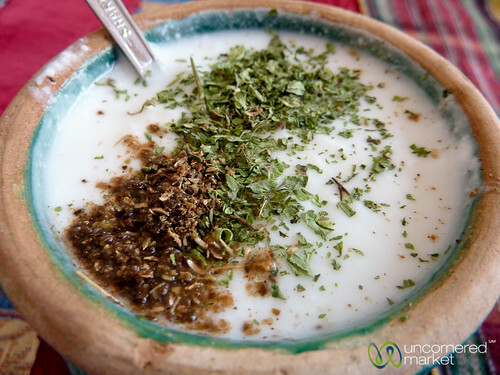 Doogh is a chilled thin plain yogurt drink, often served with mint and other dried herbs sprinkled on top. Doogh is surprisingly refreshing on a hot day. It also serves as a perfect complement to stomach-plunging, meat-heavy meals like kebabs. 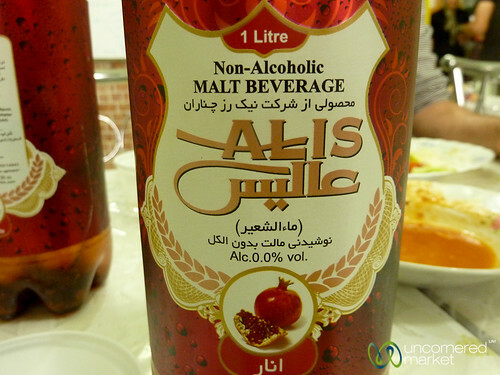 Note that Iranian beers come in all different flavors, with pomegranate being our fitting favorite. Once you come to terms with the fact that you aren’t really drinking beer, you might actually find it refreshing. Fresh fruit juice abounds on city streets, especially in southern Iran. Our visit happened to coincide with pomegranate season and we drank generous glasses of it at every opportunity. Not to mention, pomegranate consumption in volume feels both cleansing and invigorating. Our other favorite juices include carrot and melon. Usually very reasonably priced. 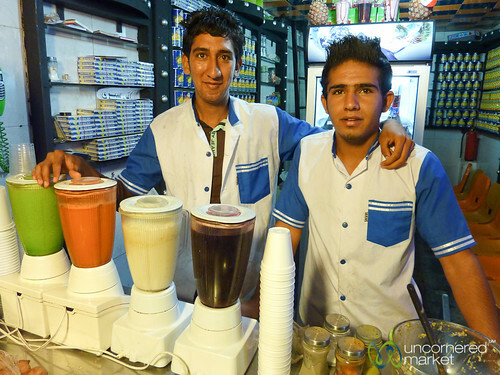 The friendly juice guys of Shiraz. Melon, carrot, and pomegranate juices ready to go. 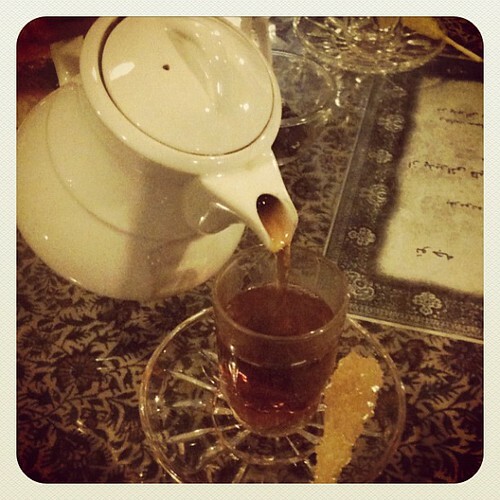 Iranian tea rooms are hubs of social gathering. 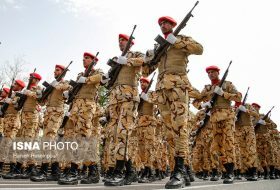 In Iran, it’s not just about drinking tea, but about lounging back on pasha-worthy cushions on the ground and spending hours with friends and colleagues. 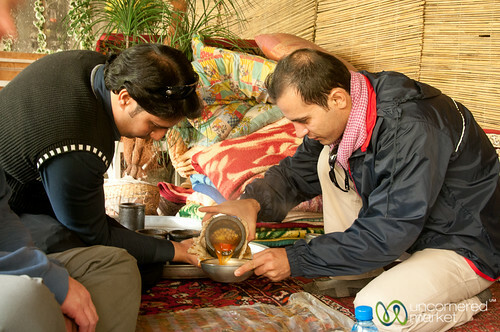 Tea houses may also offer qalyan(large water pipes or hookah), in which you can smoke sweet-flavored tobacco flavors like vanilla, apple, orange and mint. Black tea with a crystalized raw sugar wand. Taken in a misty tea house, Tehran. 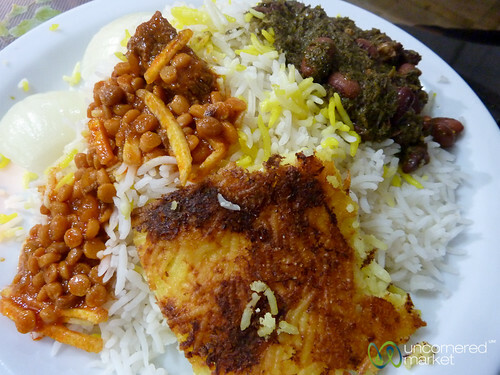 Can you find and eat vegetarian food in Iran? Certainly. Having said that, you might be limited to street snacks, breads, yogurt and picking in and around meals. If you are a vegetarian traveling to Iran, consider learning the names of a few key vegetarian dishes above, as well as “I am a vegetarian” in Farsi so that you are able to request them and be understood. 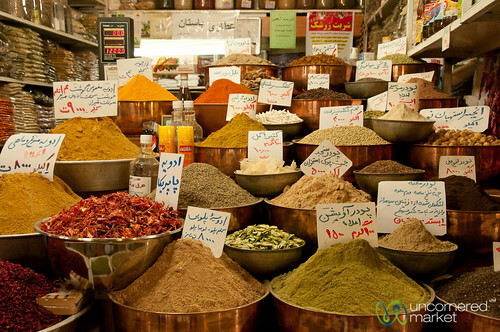 Regardless of what you prefer to eat and when you prefer to eat it, allow your curiosity to guide the culinary dimension of your trip through Iran. And you’ll also likely find yourself amidst conversations you’d never imagined having while traveling there.